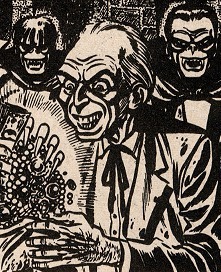 Powers/Abilities: Gorlac had presumably the usual powers possessed by vampires, such as enhanced strength and shapeshifting in a bat. Weaknesses: He needed to drink human blood to sustain himself. Without blood he became weak and couldn't even leave his coffin. He could be killed by silver bullets and wooden spikes. 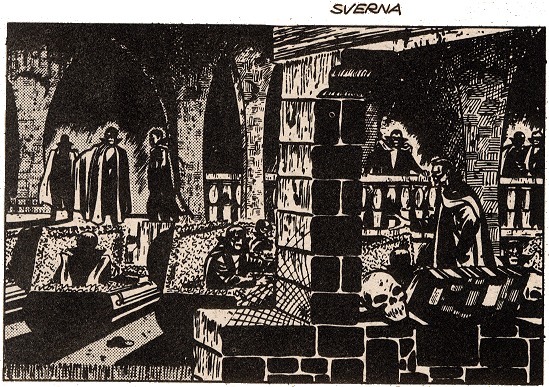 History: (Strange Tales I#9/4) - Gorlac ruled a colony of vampires in the town of Sverna, Hungary. He and his brethren killed many people to drink their blood. The police hunted them equipped with guns with silver bullets. One night, outside the castle lair of the vampires, an old man named Karl Croya was captured by a vampire, and was taken before Gorlac. The man offered to collect blood for all the vampires of the colony in exchange for a part of their treasures. Gorlac admired his courage and accepted. Every night the vampires found blood in iron cans Croya left behind for them, but after a few weeks the vampires became weak. One night Gorlac awoke one hour earlier as usual and saw an horrible scene. Croya was extracting blood from a vampire while he was still asleep. Blinded by rage, Gorlac jumped at Croya's neck and killed him. Comments: Created by unknown writer and Joe Sinnot (pencils and inks). Looking at Croya and at the policamen's clothes it seems logical that the events above described happened in the fifties. If the colony was stilll active during Doctor Strange II#62, they were probably destroyed by the Montesi formula. 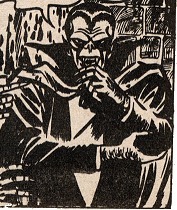 Gorlac's first name was revealed in Vampires: The Marvel Undead#1 (December, 2011). And returned to their undead existence when Blade fulfilled an ancient prophecy in Blade III#12. Croya has no known connections to any other character with a similar name. Croya was a greedy, old graveyard watchman from Sverna. One night while he was working in the graveyard, he watched a vampire assaulting a man and killing him by sucking him dry of blood. Seeing this Croya had an incredible idea: to do business with the vampires. He knew that they hid treasures and he wanted that wealth. Fearful but determined Croya followed the vampire-bat to his lair and already knew what to do. Captured by a vampire he convinced the leader, Gorlac, to spare him and to make a pact. He would give blood to all of them in exchange for jewels and gold. Croya fulfilled his part of the pact, but didn't tell the vampires that the blood he brought them was their own blood, stolen from their bodies every morning, while they were asleep: a vampire of vampires! Unfortunately for him, after some weeks, the vampires felt that something was wrong when Gorlac spotted Croya while he was "vampirizing" a vampire. Croya was killed by an enraged Gorlac. A colony of vampires existed in a castle on a hill outside of Sverna. It was not far away from the town's graveyard, but far enough to hold visitors at bay for centuries. Several dozens vampires "lived" there in their coffins. They used the castle as a base for their raids in the nearby countryside and terrorized the people to an extent that the local police forces had been equipped with weapons effective against vampires. A local policeman, a normal human, tried to kill a vampire he spotted in Sverna's graveyard. He shot at the vampire with silver bullets, but missed him. He didn't succeed in shotting at him again because the creature transformed into a bat a flew away. The victim was already dead.